The creation of novel settings for sensory experiences requires technologies and systems that surpass the standards of digital cinema. The purpose is not to exchange single components but rather to establish a chain of rendering technologies that reach from production to presentation and to integrate this chain into a network of content providers, producers and users of the respective scope. The showroom called TiME Lab provides technologies and systems for immersive video projection and is located at the Fraunhofer Institute HHI. The technologies presented in the lab allow a special sound as well as a functioning user interaction. 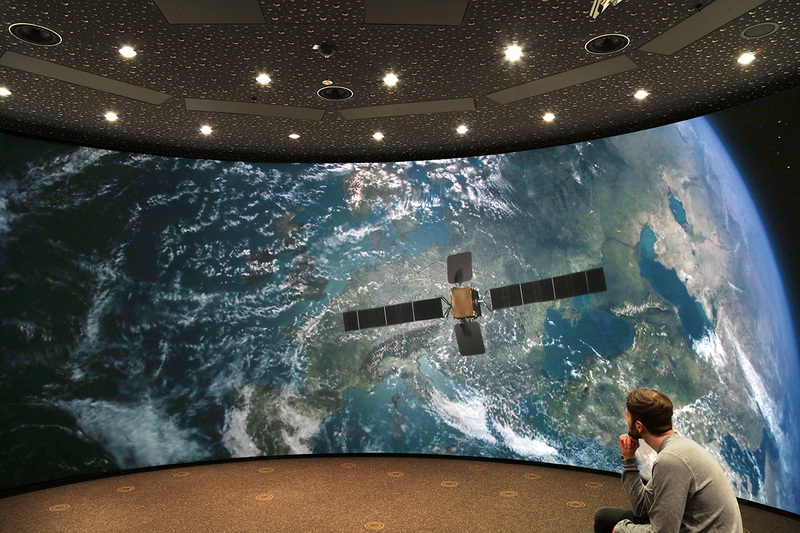 For this purpose, the rendition space provides a cylindrical projection screen with 180-degree curvature and a 3D multi-projection that is realized through the usage of 14 HD projectors. The additional IOSONO wave field synthesizing system provides an acoustics that are as close to reality as possible. A closed alignment of 120 speakers arranged at ear level as well as 15 ceiling speakers and 4 subwoofers create these realistic sounds. The use of a special acoustically transparent woven material for the screen makes it in addition possible to extend the speaker arrangement to the space behind the screen of the TiME Lab. This creates an ideal acoustic arrangement while optimizing the optical multi-projection quality. 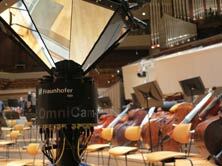 To produce ultra-high definition 2-D and 3-D video panoramas Fraunhofer HHI developed a 360° camera system called OmniCam. This mirror-based multi-camera system is in its fourth development stage and overcomes the boundaries that the production of panoramic videos faced until today. The OmniCam-360, enables not only the realization of exciting film projects but also meets the demands of a constantly growing market in the domain of virtual reality. The TiME Lab merges the different possibilities to create novel immersive experiences – from panoramic productions to the projection of panoramic recordings up to object-oriented audio renditions. The 180-degree cinema named TiME Lab, located at the Fraunhofer HHI, is equipped with a multi-projection system. This system consists of 14 HD projectors reaching all areas of the curved screen. The core of the TiME Lab multi-projection system is the CineBox, which simultaneously provides the feeds for 14 projectors. The TiME Lab has at its disposal a 140 channel planar wave field synthesizing system (WFS) to render the acoustic part of any content with great authenticity. The WFS is an object-based multiple channel sound reproduction system. This enables audio reproductions to map sounds to their sources in the same way as they would be located in a non-artificial environment. With limitations, this even extends to the acoustic space between the speakers and listeners. In addition, the acoustic character of rooms or environments, such as those of churches or concert halls, can be realistically reproduced by wave field synthesizers – listeners get almost transported into these environments. In contrast to discrete playback formats (stereo, 5.1, 7.1 etc. ), the WFS auditory sensation area is almost as large as the area enclosed between the speakers and the listeners. Another important fact is that there are no ‘sweet spots‘. The Real Time Stitching Engine (RTSE) is a software-based solution for the real-time processing of ultra-HD panoramic recordings. The software provides all necessary steps to process a certain number of omnidirectional camera images into an ultra-HD panorama. These steps include for instance color matching, warping, stitching, and blending. The software can simultaneously process multiple HD streams and runs on a single multi-core PC, equipped with commercially available graphic cards. 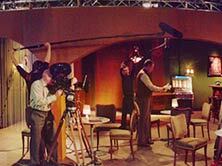 Fraunhofer HHI’s TiME Lab sets new standards in media technologies! 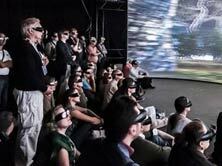 The acronym TiME Lab stands for Tomorrow‘s immersive Media Experience Laboratory. This showroom contains an entire chain of systems and applications, which can be explored and exploited within different projects. The setup integrates innovations in the areas of 180 ° video projection, steric audio rendition and the real-time broadcasting of panoramic recordings. In 2009, the Fraunhofer Heinrich Hertz Institute (HHI) opened the TiME Lab for the first time to demonstrate new media technologies. The lab is unique in its design: it measures about 60 square meters, features a 3.35 m high and 12 m long curved projection screen, has 14 HD projectors, has 120 speakers arrayed in circle at ear level plus 15 ceiling speakers, and 4 subwoofers.